THE SEARCH FOR flight MH370 has been boosted by the arrival of a British nuclear submarine in the Indian Ocean, but Malaysian police warned the cause of the jet’s mysterious disappearance may never be known. Despite extensive scouring of the remote waters southwest of Perth where Malaysia believes the jet went down, ships and planes have so far found nothing that would indicate a crash site. Malaysian police chief Khalid Abu Bakar said a three-week-old criminal investigation into what caused the flight to veer far from its intended route between Kuala Lumpur and Beijing had so far been inconclusive. In a sober assessment likely to disappoint anxious family members of the missing passengers, he said police have taken more than 170 statements so far but still need to interview more people. Ten planes and nine ships resumed the hunt today although authorities warned broken cloud, sea fog and isolated thunderstorms would reduce visibility. 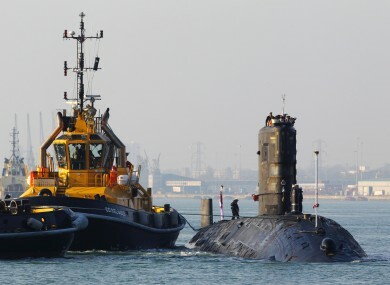 But in a boost to the search effort, Britain’s Royal Navy said the first submarine in the operation, HMS Tireless, has arrived in the area and “with her advanced underwater search capability will be able to contribute to the attempts to locate the missing plane”. Britain’s HMS Echo is also due in the search zone shortly to assist Australia’s Ocean Shield naval vessel, which is fitted with a US-supplied “black box” detector and is expected to arrive on Friday. Malaysian police are probing the backgrounds of all 239 people on board the Malaysia Airlines jet, including the 12 crew members, as well as ground crew and flight engineers. Their investigation has focused on the possibility of a hijacking, sabotage or psychological problems among passengers or crew. Other authorities have warned that unless the wreckage and the black box are found it may never be known what caused the plane to lose contact on 8 March. The battery-powered signal from MH370′s black box, which records flight data and cockpit voice communications that could indicate what happened, usually lasts only about 30 days, with time fast running out to find it. Australia has warned against expectations of quick success in the difficult task of recovering the black box from the deep and vast seas. Retired Australian air chief marshal Angus Houston, who is heading a new coordination centre in Perth, reiterated that the odds were stacked against them. “The reality is it’s the most complex and challenging search and recovery operation I’ve ever seen,” he told national radio. The personal jet of Oscar-winning New Zealand movie director Peter Jackson is also now reportedly being used in the multinational hunt for the plane. Jackson, the director of the “Lord of the Rings” and “The Hobbit” movies, has personally approved the use of his Gulfstream G650 in the search, Radio New Zealand said. His spokesman reportedly said the company which operates the long-range aircraft had chartered it to Australian authorities. Malaysian Prime Minister Najib is also due in Perth this eveing, where he will tour the air base being used as a staging post and meet with his Australian counterpart Tony Abbott. Malaysia’s handling of the crisis, marked by piecemeal and occasionally contradictory information, has been widely questioned, especially by distraught relatives of the 153 Chinese nationals aboard. Email “British nuclear sub joins search for MH370 as time is running out to find black box”. Feedback on “British nuclear sub joins search for MH370 as time is running out to find black box”.